Using freshly felled wood on a project isn’t for every woodworker, but it can be well worth the extra effort and care it takes to produce a true heirloom. Green wood projects aren’t necessarily limited to hand-woven basketry, rustic stick furniture, primitive stools or carved and turned items, but they’re very popular and lucrative efforts. Working with fresh wood can be somewhat more liberating than working with cured wood most woodworkers prefer. Using hand tools takes you back to the basics and the freshness of the wood can remind you that you’re working with something that still feels alive. This style of woodworking isn’t for everyone, but if you love the feel and smell of freshly cut wood, are up to the challenge of learning a new skill and enjoy an occasional walk through the woods, maybe this type of woodworking is for you. Most trees have unique properties that lend themselves to specific uses. If you plan to go all out and harvest your own wood, finding a nearby wooded area isn’t difficult in most of the country. In other regions, it may involve more of an investment in time and travel. But wherever you live, try to use green woods that are native to your area. 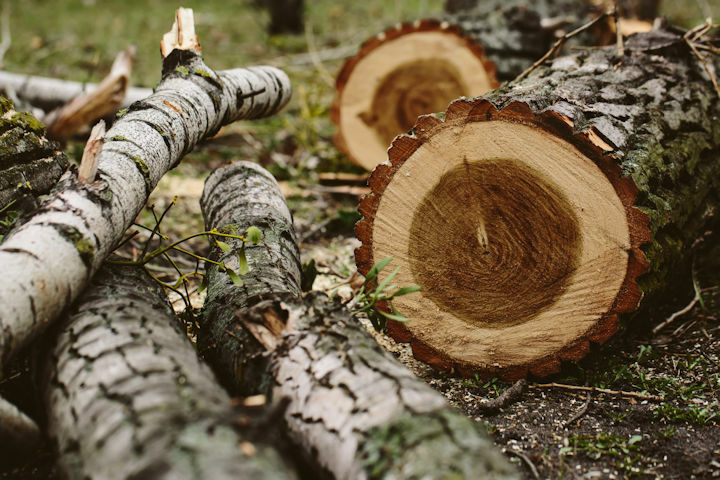 While getting permission to cut your own timber isn’t always easy, especially on private land, it might be worth the research and effort if you’re looking for a certain species. If lumberjacking isn’t for you, local lumber mills and yards usually carry plenty of green wood. In many areas, fresh logs are sold by farmers or homeowners that have just cleared a portion of their land. You might even arrange to purchase wood from a local tree removal business. Because the price of green lumber is typically far lower than dried wood, you can usually pick up some high-grade wood at a reasonable price. There’s no point in harvesting or buying fresh logs if you’re going to let them sit for any length of time. If you want to work with green wood, make sure to turn or cut it as soon as possible. Leaving logs in the round and in long lengths is the best way to help preserve the wood’s natural moisture. The softness and flexibility of the wood makes it a pleasure to work with, especially on a lathe or using a chisel. If you plan to use green wood to create an unusual piece, always go for the unusual or downright ugly wood. Knots, gnarls, bumps, and weird growths ensure very atypical results. If you sell or exhibit your work, that poor, ugly-looking chunk of raw wood can make all the difference in inspiring your natural creativity. If this is your first attempt at working with green wood, don’t overcomplicate it. Creating simple shapes or straight lines is the best way to get a feel for the wood. You can move on to more adventurous projects once you master some basic skills. Learning to maintain a specific thickness on a board, utensil or other items will help build your skills while reducing the chance of splitting while drying. Wet sanding is a great way to turn green wood. Keeping a container of water handy makes an already easy process more pleasurable. The rule of thumb is to use chilled water during hot weather and warm water in the winter. Using a waterproof abrasive will prevent the grit from becoming embedded in the wood or damaging the surface. Countless woodworkers have discovered that working with freshly riven stock that’s full of moisture, sap and bright colors is a great pleasure. Whether using it to build, side or panel a rustic home or cottage, handwork an artistic piece or turn beautiful wooden bowls, green wood is just as versatile as dried woods. I am new to woodworking and building my first workbench. I got some 2x6x8 oak ruff cut that looks pretty green. I asked on another wood forum and was suggested I let it dry for a year a inch. Well everything is built but the top. I really dont want to wait 2 years to finish my bench. Any suggestions? I don’t know what kind of oak you have. Some species dry more uniformly than others and a lot depends on how straight the grain is. I have some thick boards that have some warp that I intend to use some 1/2″ all thread run through bored holes. I figure three or four 30″ or so should hold the top together (along with some good wood glue). You need to true the edges as well as possible and get the together quickly because warps are hard to straighten. Good luck. I brought home some storm-felled oak from a neighbor’s yard a few days ago, and when I started to work with it, I found it was full of wood borer larvae. What should I do? I have this stuff in buckets and a wheelbarrow in my garage…Are these larvae a threat to my house/furniture?